Not going to lie, having seen and written about both artists multiple times before I was a little worried there wouldn’t be much new material for this article. What more could I possibly say without coming off as a star struck fanboy? 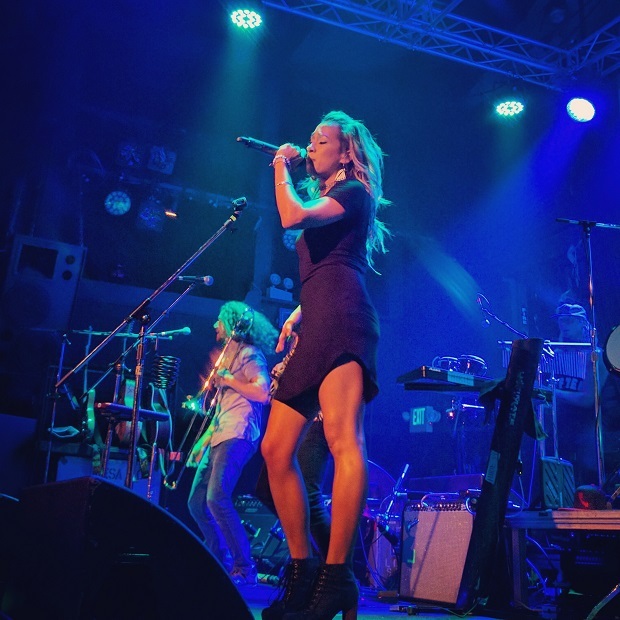 Luckily for me the answer was plenty as Hirie and Nahko both took their performances to a new level in Santa Cruz last Saturday night at The Catalyst. The double header of an evening was lead off by Hirie, the pint size power house pixie of island music. Even in 4 inch heels you feel like you could pick up all five feet nothing of her and put her in your pocket. Then she opens her mouth and her voice outweighs her by a hundred pounds easy. She has amazing range and her pitch really does have a weight to it, filling the small seaside venue easily and fully. I’ve never seen someone smile so hard, so long and so genuinely through a performance. She clearly loves every second on stage and darn it, just seems like a sweetie; then, you listen to her lyrics. Playing old singles titled ‘Sensi Boy’ and ‘Higher’, and the new ‘Don’t Take My Ganja’ off her recent album Wandering Soul, her love of cannabis is clearly on display. Also, I’ll let you potty minds figure out what her new song ‘Woman Comes First’ is about. Personal favorite of the concert was her newest single ‘You Won’t Be Alone’. It is just catchy AF as the kids say, and I also though it was the supporting bands best song of the night, really highlighting each instrument at different points and bringing them back on time and in perfect harmony for that hook. Hirie, her band, and their music have really grown into their own skin in this second album and was great to see it translates live as it did Saturday night. Nahko brought his medicine to the stage for act 2 with the subtleness of a screaming ambulance. He surprised everyone by coming through the crowd to the front of the stage, bullhorn in hand and blaring his calls for change. It was a theme that carried through their set as it often does. In my opinion his shows aren’t even concerts. They are sermons, a rally, a protest, a meditation and a performance. Also fresh off a new-ish album Hoka, this stop by The Catalyst was no different. 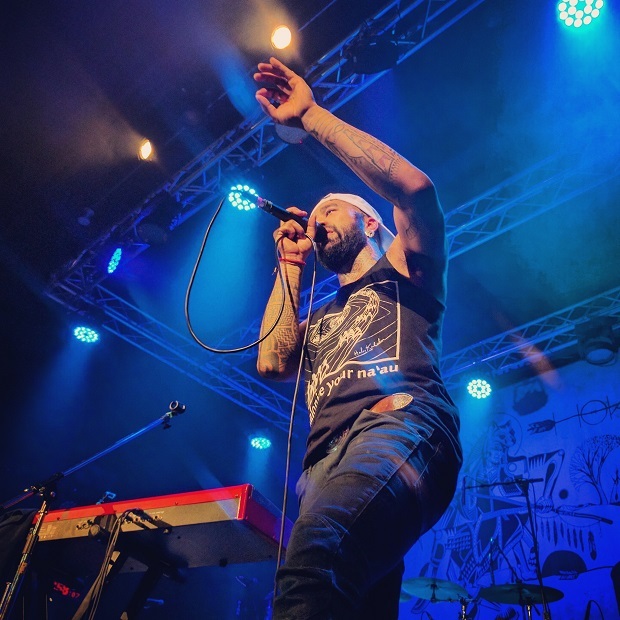 Playing new songs ‘We Shall Overcome’, ‘Build A Bridge’ and ‘Make A Change’, you’re probably starting to put together that Nahko isn’t all too pleased with the current set of problems facing this country and others for that matter. Those songs and others call to light the differences between the haves and have-nots, the oppression of people of color, the desecration of our earth and its natural resources; all heavy topics to be sure. The light he sheds on these issues is done beautifully and you don’t feel depressed about the state. You end up feeling empowered and hopeful and want to be a part of the solution, and I know at least one person left feeling that was Saturday night and I think that makes Nahko a happy bear. When he’s not playing Bernie Sanders rallies or fighting the Dakota access pipeline, Nahko and Medicine for the People sometimes play music and make the world a better place one song at a time. I invite you to join his movement next time his winds of change blow through you’re town. He’d like that and so will you. This entry was posted in music, shows and tagged bernie sanders, build a bridge, catalyst, dakota access pipeline, don't take my ganja, higher, hirie, hoka, island, make a change, nahko, nahko and medicine for the people, reggae, santa cruz, sensi boy, wandering soul, we shall overcome, woman comes first, you won't be alone. Bookmark the permalink.